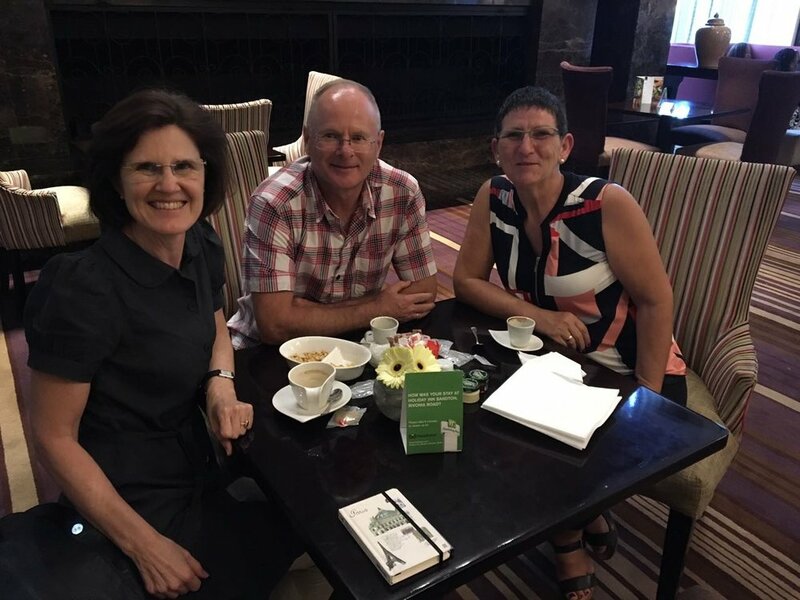 After a 35 year hiatus Francien and I returned to Johannesburg for a few days to reconnect with old friends and see familiar places. We once called the north-eastern suburbs home and for the sake of trying to find out how much had changed, we rented a car and explored the area. What we remembered back then as open undulating ‘veld’, has now been built-up with modern residential housing, industry parks, roads, highways and shopping malls. The landscape had changed so much that we struggled to find our way around. Strangely enough, we did recognize the odd curve of a highway off-ramp, the hill overlooking Gillooly interchange, a shopping center, a mall, the railroad track and the skyline of down town Johannesburg in the distance. Thank goodness, the GPS on our smart phone works everywhere in the world! As so many mega-cities in the world, traffic in Johannesburg is a problem. We got caught in a few traffic jams, especially during rush hours. Hawkers who used to line the main streets, selling cloth, food, flowers, wood, offering haircuts, pulling teeth; they were all gone. At 'robots' (the South African word for traffic lights) only a few still tried to clean our windscreen for money. The blue smoke belching Putco busses, which transported the black people between the townships and the places they were employed, - no more. They have been replaced by clean looking taxi vans. We drove passed our first apartment in Kempton Park. This was blue collar housing back in 1982: not the most luxurious place we ever lived in, but looking at it now it was like we were hit by a brick! Dilapidated, metal security bars and gates, men hanging around, others hailing bags with recyclable rubbish, a dirty convenience corner shop. The launderette just a few hundred meters down the road where we washed our cloth once a week: - no more. I saw an old man with a haggard face, barefoot and sweat stained ripped cloth, searching for food in trash bins. Homeless people stood at traffic lights holding cardboard signs like ‘Food for my family’. ‘Francien, keep the windows closed and doors locked’, I said while driving slowly through the streets, ‘this is a very bad neighborhood’. I used to work for AECI (African Explosives & Chemical Industries) at Modderfontein just outside Kempton Park. At the time it was the biggest explosives plant in the world, built in the ‘veld’ north of the biggest gold reefs in the world. New technology has made the old explosive plants redundant and the chemical complex has been converted into an industrial park. The Gautrain passed the decommissioned detonator and fuse plants. Even after 35 years, when I sat on a bench in Lakeside looking at Modderfontein factory hill, smelling the crisp air, seeing the Ibis birds foraging in the high grass, hearing the pigeons and enjoying the sun burning on my skin, for a moment I felt home again. ‘I used to work in this factory’, I said to the attendant in the nearby explosives museum. He showed me nitroglycerine tubs, Atlas mixers, cartridgeing machines and compressors I used to work with: rather depressing, I am getting old! The Modderfontein Golf Club, which was back then only for white men, was still there. The old colonial clubhouse converted to an office building. We reached Birch Acres, a suburb of Kempton Park close to Tembisa and stood in front of our first house. The once nice planned clean villa’s with tidy gardens and crystal clear swimming pools now looked unwelcoming, disorderly, some houses converted to nail parlours, others run-down. The paint on some garden walls was flaking. Barbed wired high walls around the houses, private armed response units driving around in patrol cars and security signs were a constant reminder of the notorious violent crime. In 1982 crime in ‘white only’ area’s was hardly heard off, now South Africa has one off the largest private security industry in the world! Would you believe it, despite all this, for a few minutes it was 1982 again. It still reminded me of my Suzuki off-road motorbike I used to go to work with everyday; our two dogs; Francien driving our old Golf to her work at Natal Building Society in Kempton Park. We used to talk about ‘Pommies’ (Englishmen), Boeren (Afrikaners), Blacks, the apartheid boycott, rugby, golf and ‘home’. We never talked about the weather, because that was always gorgeous! Our first daughter was born here! We bought music (Michael Jackson ) on vinyl and listened short wave radio Nederlandse Wereld Omroep to keep up with the news back home. And all those parties with braais, lots of alcohol and bravura. At one of those parties I remember Francien saying: ‘this is it, this place is for us’. Happy memories came flooding back. 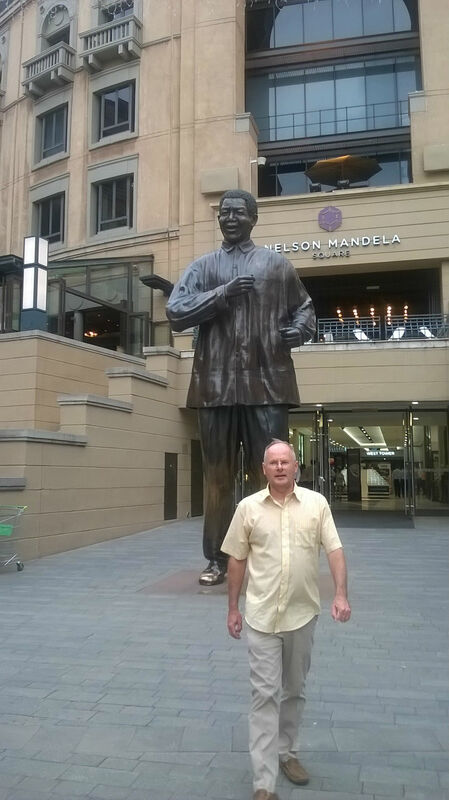 We drove through Alexandra township to our hotel in Sandton and the contrast was as big as ever. But this time Alexandra looked better organized, had clean main roads and we saw many government built brick houses (each 42 m2). But there were still those shacks made of corrugated metal, plywood, sheets of plastic, and even cardboard boxes. Sandton still looked the same, its Malls full with ritzy stores where the password was clearly "money is no object", restaurants and international hotels. But now the people lived in their luxurious houses, inside gated communities protected by high walls topped with electric fencing and armed private guards at the entrances. The people we met in our hotel, restaurants and shops were friendly and helpful. We do not know friends from back 35 years still living here anymore (many left for UK, Holland, Morocco, USA, Australia), but met up with others from the time we lived here in 1999. They were proud of what their country had achieved since Nelson Mandela became the first black president in 1994, but worried about the deteriorating services, rampant corruption and education system. ‘More and better education for all people should be the utmost priority of our government’, we were told during a dinner. Johannesburg had grown and many large building sites were prove it still is expanding beyond what we would have ever thought possible all those many years ago. More people had good government built housing in the townships, illegal shanty towns like Diepsloot now have a developed infrastructure, providing basic utilities, schooling, shops, churches and medical facilities. We had seen so much changed for the better, but much more remains to be done. As you have guessed by now, this was a nostalgic trip for us. In 1982 we had no support groups, no cultural training, no special company support and we could not effort to fly back home every year. We were on our own and by today standards totally unprepared! I am under no illusion that our years in Africa can be repeated in the same way today, because modern travel and the Internet have taken away the adventure of remoteness and with that the special sense of togetherness with people all far away from home. 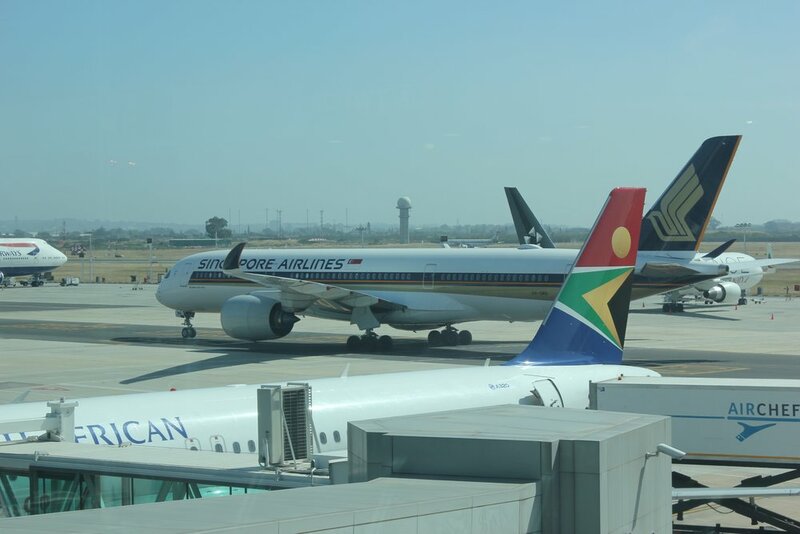 Sitting in the modern airport departure hall I recall the few planes which used to land on ‘Jan Smuts’ airport: KLM, Lufthansa, Sabena, British Airways, TAP, … (the boycott against apartheid prohibited airlines to fly to South Africa). It has been an intense couple of days, juggling memories of the past with the new realities on the ground. Those memories Francien and I will keep long, along with the sense of satisfaction that having lived in South Africa has been one of our greatest experiences.